We all know that water is crucial. In fact, every organism in our body needs water to survive. Not only does water help our body to transfer oxygen and nutrients to the cells, control body temperature and assist metabolism, but also it flushes out the waste and the poison out of our body. Sweating too much after intense activities, and you will start to feel dizzy. Three days without water, you are not going to be able to survive. Despite its importance, water intoxication is the real thing. When we drink too much water, you are going to suffer from hyponatremia. This article will thus walk you through the definition, causes, symptoms, diagnosis, treatments, and preventions of hyponatremia. We are commonly advised to drink about 8 glasses of water a day to stay hydrated. However, the truth is that this number is somehow arbitrary. There has been no scientific evidence, research or study that support this advice. Listen to your body; you know what proper amount of water you have to drink every day. Also, there are a lot of publications tell us that our body sometimes cannot tell the difference between hunger and thirst. So when you feel hungry, you need to drink. This advice is not entirely wrong, but it does not mean that you have to drink until you are full. You are supposed to drink just a half or 1 glass of water when you feel hungry. And then, wait for about 10-15 minutes, if you still feel hungry, you definitely need to head for your meals. Hypo means underneath, beneath and low. Natr is the prefix for Sodium. Emia means blood. Altogether, Hyponatremia means low Sodium in the blood. An average Sodium level is 135-145 mEq/l. Thus, anything less than 135 mEq/l is hyponatremic. In order to understand all those causes, signs, and symptoms of hyponatremia, it is important to know how Sodium works in the human body. Sodium is an essential electrolyte that helps regulate the water both inside and outside the cell. Water and Sodium love each other; water always wants to be where the Sodium is at. Wherever Sodium is more congregated at, water will run to that place, and that’s what happening with hyponatremia. 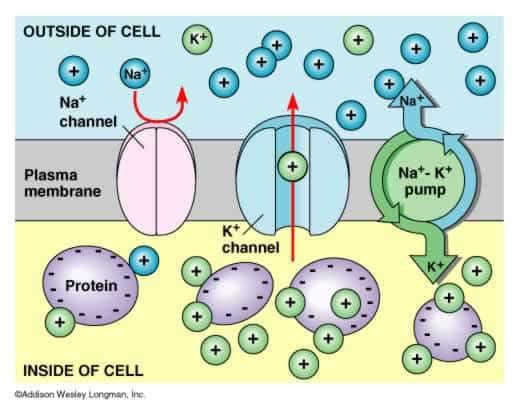 In hyponatremia, you have a low amount of Sodium outside the cell. Anything of a low concentration wants to move to a higher concentration. As there is more sodium inside the cell, where water wants to be, all that water will rush into the cell, expand the cell and make the cell burst. This action affects cells everywhere in your body. One of the cells which are especially sensitive to this is brain cells. And whenever they swell, you are going to have the most popular symptoms of hyponatremia – confusion. Euvolemic Hyponatremia: This is when the water in the body increases but Sodium stays the same, which makes the Sodium becomes diluted. You will suffer from the Syndrome of Antidiuretic Hormone. This hormone will be increased in secretion, and the body will start to retain water. Other consequences can be diabetes insipidus, adrenal insufficiency, and Addison disease. Hypovolemic Hyponatremia: It is a decrease in Sodium and a decrease in water. You become dehydrated as you have a loss of blood volume. Common symptoms of this are vomiting, diarrhea, NG suction, burn, and excessive sweating. Hypervolemic Hyponatremia: This is when both water and Sodium increase, which leads to fluid volume overload. You are likely to have swellings on your body and suffer from congestive heart failure, kidney failure, excessive infusion of saline, and liver failure. Remember the phrase: SALT LOSS. Lethargic. Feeling tired and just wanting to sleep. Shallow respiration. This symptom happens late due to the weakness of skeletal muscles. When you are getting away from the severe symptoms of hyponatremia, or your case of hyponatremia is mild or moderate, It is important to put your body back to its normal homeostasis by drinking less water and replenishing the electrolytes. After an episode of vomiting, you definitely want to stay away from soda and drinks that contain sugar and to be gentle with your stomach. Try to do your own electrolyte water at home by using the fruits, honey and salts. Mix the ingredients together and keep it cold. Sip this frequently throughout the day. As you start to feel better, slowly add back dry plain foods. 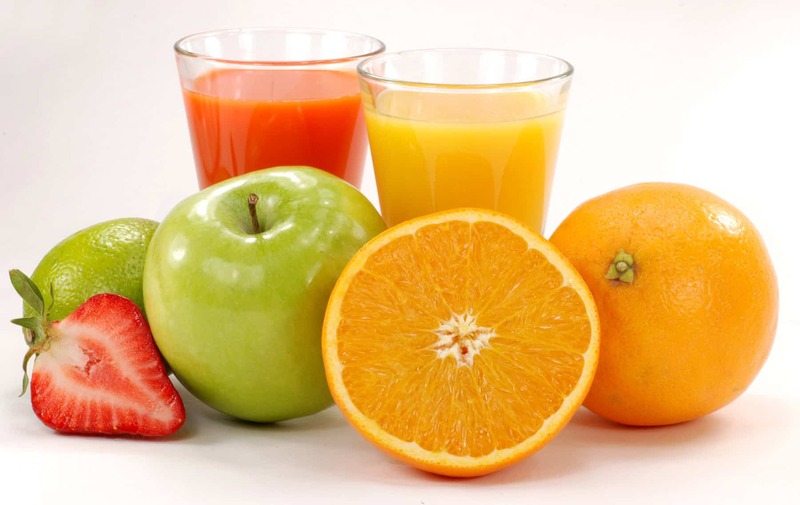 You can try replacing the orange juice with other potassium-rich fruits. Such as papaya or apricots. Squeeze the lemonade. Mix the ingredients together and stir them with 1/2 liter of water. Blend the ingredients together and you will have an energy-ade. Not only can these drinks provide you with energy but also they have great properties of recovery. Please note that if you are suffering from a severe case of hyponatremia, it is always advisable to be hospitalized as soon as possible. Only doctors can process the proper and exact evaluation and treatment procedures. You are taking the first step to preventing hyponatremia- read this article. Also, by sharing this article, you can help people you love to avoid diluting their blood by consuming too much water. Listen to your body. Water is always important; it makes you healthier, it is incredibly refreshing, especially after a tough exercises or training. 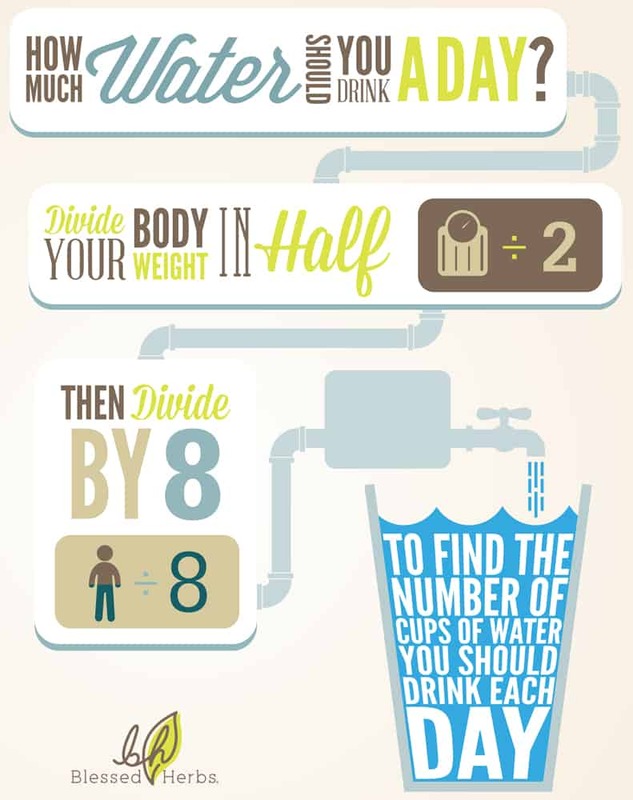 Drinking water is always good, as long as you don’t overdo it. There are factors that will affect your water needs, such as exercise, environment, illness and pregnancy. See the doctor regularly. 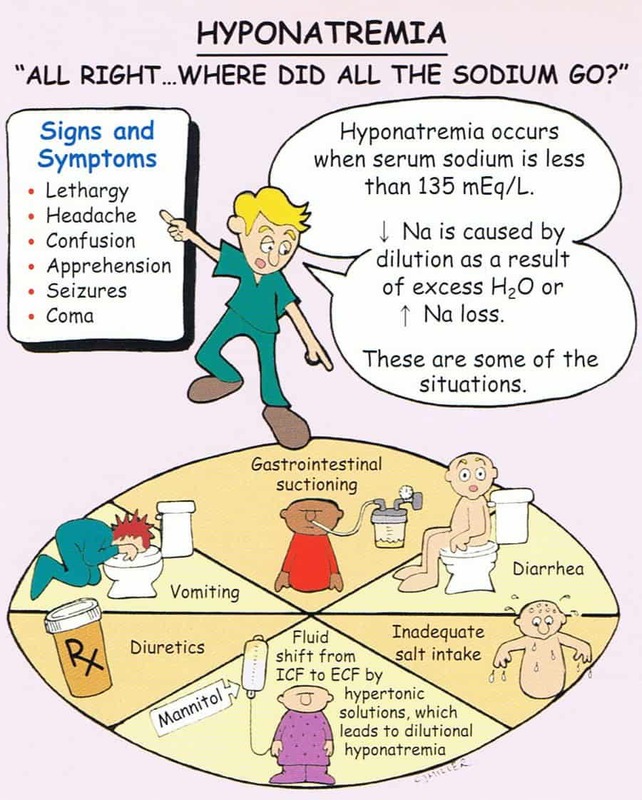 Your cardiac status, respiratory status, neuro renal and GI status, all these systems are going to be affected when you have hyponatremia. An appointment with the doctor is to ensure you are doing well with your case or to confirm your sodium level is still appropriate. Also, the doctor will administer an IV solution sodium to restore the balance of fluids and sodium in your body. In case, there are any signs of symptoms of the hyponatremia; you are sure to be diagnosed on time. Eat and drinking enough liquids, foods and electrolytes. Make sure that your meals and drinks are rich in sodium, but not too much; they can dehydrate you. A good amount of sodium will facilitate the function of your heart, kidneys, and bones. But a exceeded amount of it will probably have the side effects. Bacon, butter canned foods, hotdog, table salt are some in the list. A lot of people don’t think of canned foods having a lot of salt in them they think oh I’m buying some vegetables canned corn, so that’s healthy. When in fact, these food are good for providing electrolytes. Try not to take in too much dairy and antacid products because they bind to the cation and affect absorption. Drinking water in the morning. There are at least 6-8 hours per day during our sleep; we do not drink anything. So as soon as we wake up in the morning, our body has very low levels of water, and it’s a good idea to start your day by drinking some water. It can probably the first step to energizing your day and help you stay hydrated throughout the day. Staying hydrated is good and essential, but when you drink too much water, you will suffer from water poisoning. As mentioned in the article, when your body contains too much water in the bloodstream, the Sodium will be diluted. This dilution leads to a lot of failures in your cardiac, respiratory and neuro renal systems. For severe instances, it is a must to seek for advice and prescriptions from professionals and doctors. For mild and moderate situations, you are advised to follow the above possible treatments and preventions. Remember, you do not need to be an athlete or under a vigorous training to find yourself drinking an excessive amount of water. Anyone with the diluted amount of Sodium can be a victim. Monitor the water intake and do not let water – a seemingly harmless substance pose a threat to your health.